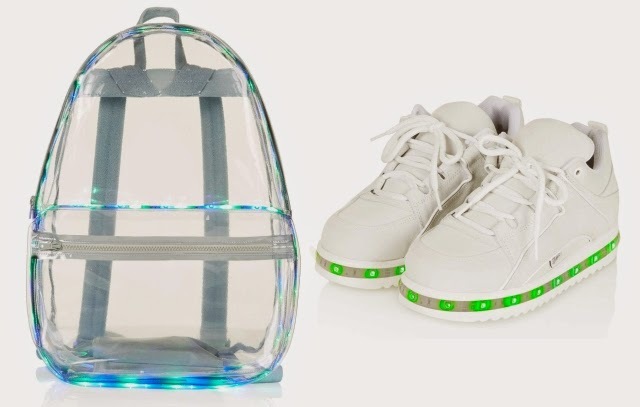 I’ll start this post by asking who doesn’t want to carry a LED Light Up PVC Backpack or wear white LED Single Stacked Trainers? Because I sure as hell do. Now we can, thanks to the latest Ashish x Topshop collab, which you can see in all it’s glory here. I would like to rock both the shoes and the bag while I’m gracing the fields at Latitude festival this year. Just imagine me, in the dark, like a glow stick, shaking my tail feather for Bombay Bicycle Club. Isn’t that a picture that needs to be recreated in actual life? I’ll tell you who will also want this bag, my partner-in-crime, Chez. I’ll halve it with you Chez. £175 each (gulp). What do you reckon? You can get the backpack here and the shoes here. Right behind me.